Street photography is about hitting a pause button. Taking a split second to record a moment. Star Trek’s Prime Directive is “don’t get involved with or noticed by the locals”. Follow this philosophy -don’t actively impact the scene in any way. Move to get the right perspective, change lenses, fire up a flash – but generally without interacting with subjects. Scenes have a way of changing when you get involved. The upside is that you can usually get closer. There can be some exceptions, but asking people also gives them the opportunity to refuse. Refusal can hit your confidence hard, if you let it. I only ask for permission in very specific circumstances. There is only myself and the subject in close proximity. Movement is restricted, ie. in a closed space where you can’t take a quick snap and keep moving easily. The subject has “made” me – and made significant, unavoidable, eye contact. If I need them to move to recompose the frame. So, only ask for permission when you cannot avoid it. Henri Cartier Bresson believed in not being noticed. So do I. Tips To Achieve Inconspicuosity – Gear. Inconspicuosity – I am not sure it is a word, but it is a way to describe how to take photos without being noticed by subjects. Less creepy looking = more inconspicuous. Avoid Looking Like a Pro. Pros are always up to “something”. Consider a compact or rangefinder camera. The bigger the camera and lens the more you look like a pro to the average person. Pro photographers all have suspicious ulterior motives – using your likeness in an advertisement, gathering evidence, preparing terrorist attacks, catching you doing something wrong or silly, and so on. 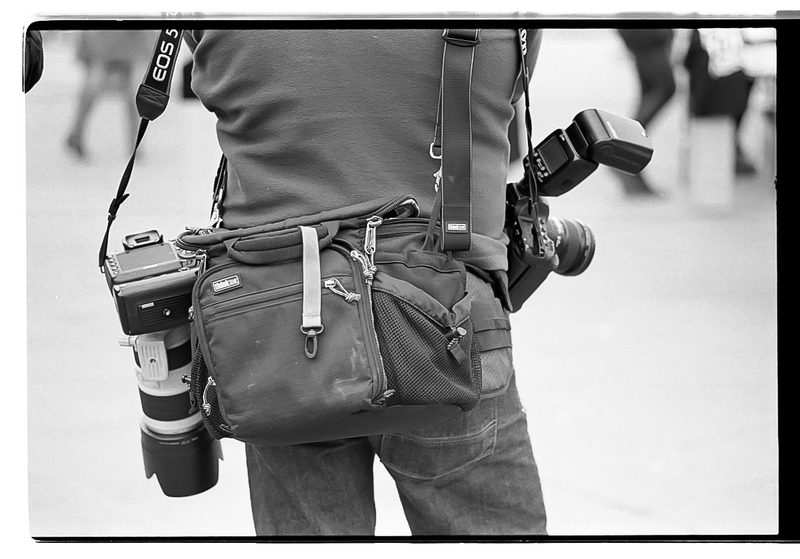 Many street photographers use rangefinder or compact cameras. Not very threatening are they? They both kinda look like something your mum might use? Not too many people care when you point one of these in their general direction. Both cameras deliver excellent image quality. Even on the plane, nobody cared when I started clicking away with my compact film camera. OK, you may not be a massive film nutter, but at least read some reviews on cameras like the Nikon Coolpix A, Ricoh GR, and Fuji X100s. Rangefinders will feature in more detail in another post. Suffice to say, they are smaller due to having less internal stuff and still delivering great quality. Leica rangefinders come at a significant price premium though – the old “if you have to ask, you can’t afford it”. Some put black tape over the Leica branding to avoid tipping off people – including Bresson, I believe. If you have a DSLR, that is cool. Just don’t stick a 70 – 200mm lens on it. Go for a fixed focal length (say 35mm or 50mm), smaller lens. Remember, the longer the lens, the more you will get noticed. Avoid lugging around a massive backpack. Nothing says creepy more than a person with a big camera and massive backpack. How many dead bodies you got in there, pal? There are more tips on Inconspicuosity here.